^ 1.0 1.1 Furlow, Robert C. Sedan Crater (PDF). National Register of Historic Places Registration Form. National Park Service. October 5, 1993 [2009-05-25]. 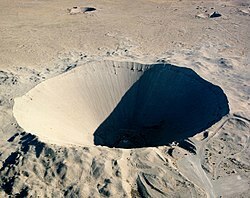 ^ Sedan Crater. KNPB. [29 November 2010]. （原始内容存档于2008-07-15）. ^ NTS 50th Anniversary Newsletter—Sedan Tested Use of Nuclear Explosives to Move Earth. US Department of Energy Nevada Site Office. [25 September 2011]. （原始内容存档于2011年10月1日）. ^ Possibilities for peaceful nuclear explosions. An IAEA review of the 1968 book: The constructive uses of nuclear explosions by Edward Teller. (PDF). （原始内容 (PDF)存档于2015-03-20）. ^ Henry Brean. Nevada Test Site gave astronaut trainees taste of lunar landscape. Las Vegas Review-Journal. July 19, 2009.